Recently while in Atlanta I had a chance to visit the Atlanta Botanical Garden. The artist Dale Chihuly still had his sculptors in blown glass there on display. What impressed me was how art like this fits in so well with the garden. It was as if the two were meant to be together in one burst of nature and color. What I sometimes find difficult is how much art to include in the landscape as well as where to place it. The Atlanta Botanical Garden spread Chihuly’s twenty works throughout the garden in such a way you could enjoy the garden as well as his artwork. The Chihuly exhibit has now gone to Denver after its three months at the Atlanta Botanical Garden. I was happy to see this artwork contribute to a special Garden which by itself is a work of a art. Enjoyed reading about the Dale Chihuly exhibit in Atlanta.His art is beautiful inside but becomes so much more in a garden setting.Love the bridge in Tacoma,saw that a while ago when visiting Seattle.Whilst there visited a fabulous Japanese Garden and of course Burchert Gardens in Victoria. Hello Carol, thank you for the comment. I am happy you know Chihuly’s work. 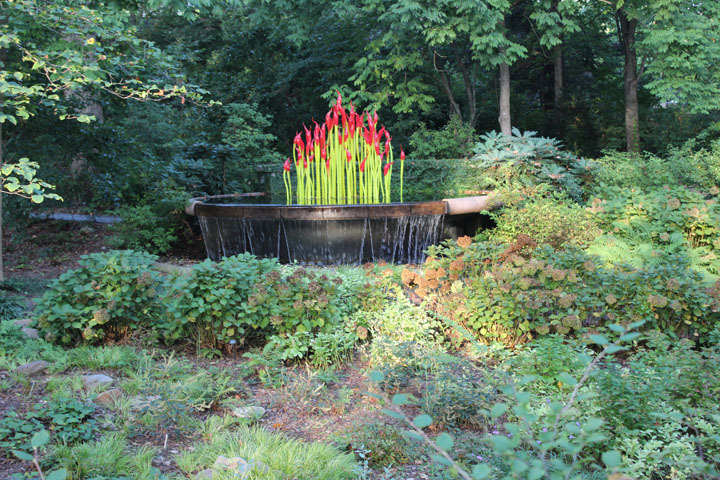 You know how outstanding a presence it would make at a place like the Atlanta Botanical Garden. Could not believe the size and beauty of the pieces that looked stunning in the context of the garden.